If you have children over the age of 11 years and you are looking for something rewarding and fun for them to do this summer, then we recommend signing them up for our Swim Camp/Jr. Lifeguard course. This camp will focus on proper stroke performance, endurance, team work, CPR, and lifeguard rescues. Camp is taught and run by American Red Cross Lifeguards. The last day of camp our American Red Cross Lifeguard Instructors will come to assess and test the skill students have learned. After passing this skill tests, students will receive a Jr. Lifeguard certification, First Aid, CPR/AED certification and improved swimming skills. A Jr. Lifeguarding course is a great way to teach your children, discipline, teamwork, and the value of helping others. These courses will also prepare students for a full Lifeguarding course when they reach the age of 16. 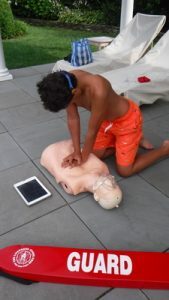 For children, over 15 years old we offer American Red Cross Lifeguard Camp.